what is laminar flow definition? what is turbulent flow definition? The Reynolds number has broad applications in real life. It can describe liquid flow in a pipe, flow around airfoils or an object moving in a fluid. In the following text, we have provided Reynolds number equation, units discussion and comparison of laminar and turbulent flows. Read on to find out what are laminar flow and turbulent flow Reynolds numbers. You will also find some examples of calculations which can be done with Reynolds number formula using this calculator. Are you interested in fluid mechanics? You should also check our buoyancy calculator or Bernoulli equation calculator. They can be very useful in analyzing fluid motion. Reynolds number is one of the characteristic numbers used in fluid dynamics to describe a character of the flow. For example, if you want to compare a small-scale model (e.g., model of an airplane) with a real situation, you should keep the Reynolds number the same. The Reynolds number is the ratio of inertial forces to viscous forces exerted on a fluid which is in relative motion to a surface. On one hand, inertial forces generate fluid friction which is a factor in developing turbulent flow. On the other hand, viscous forces counteract this effect and progressively inhibit turbulence. The Reynolds number definition generally includes the velocity of a fluid, the characteristic length (or characteristic dimension) and the properties of the fluid, such as density and viscosity. If you want to learn more about fluid viscosity, you should check out Stokes' law calculator, where you can find, among others, viscosity definition. Although the Reynolds number can be defined in several different ways, it remains a non-dimensional factor. Now, you probably want to know what Reynolds number means at all. 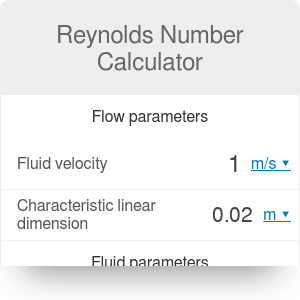 Reynolds number is used to predict whether the fluid flow will be laminar or turbulent. What is laminar flow? It occurs when viscous forces are dominant and is characterized by smooth, constant fluid motion. Reynolds number for laminar flow is typically Re < 2100. Turbulent flow definition is the opposite. It is dominated by inertial forces and is characterized with chaotic eddies, vortices, and other flow instabilities. Turbulent flow definition is usually employed when Re > 3000. But what happens when 2100 < Re < 3000? In this situation, the flow will begin to change from laminar to turbulent flow and then back to laminar flow. It is so-called intermittent or transitional flow. Therefore, the choice of laminar vs turbulent flow isn't always easy and possible. Dynamic viscosity μ is a quantity that measures the force needed to overcome internal friction in a fluid. The units of dynamic viscosity are: Pa/s, N/(m²*s) or kg/(m*s). Kinematic viscosity ν is the dynamic viscosity divided by density ν = μ/ρ. Therefore, it's a quantity that represents the dynamic viscosity of a fluid per unit density and is expressed in m²/s. ν is the kinematic viscosity of a fluid (ν = μ / ρ). a flow in a pipe, we can use either its internal radius or diameter. Other shapes usually have a defined equivalent diameter. For example, let's calculate the Reynolds number for the water flow in a L = 2.5 cm diameter pipe. The velocity of tap water is about u = 1.7 m/s. In our Reynolds number calculator, you can choose (as a substance) water at 10 °C and you obtain Reynolds number Re = 32 483. Hence, the water flow is turbulent. Reynolds Number Calculator can be embedded on your website to enrich the content you wrote and make it easier for your visitors to understand your message.